July 26, 1902 – The Chicago Daily Tribune reports that the People’s Gaslight and Coke Company has purchased a building and leasehold interest of the property at the northwest corner of Adams Street and Michigan Avenue for $200,000 from the Lake Hotel Company. This will be the site of the company’s new headquarters, a 21-story building designed by Daniel Burnham and Company, finished in 1911. Although People’s Gas moved out in 1995, the building still makes a statement across the street from the Art Institute of Chicago with each of the columns at its base made out of a solid piece of granite that is 26 feet tall, four-and-a-half feet in diameter, weighing 30 tons. 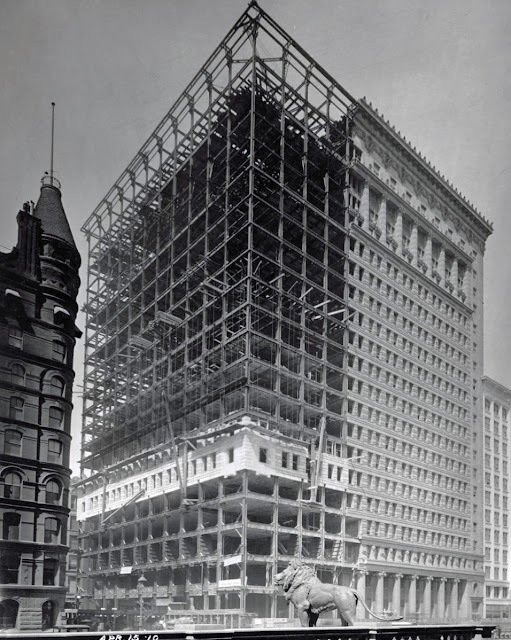 The photo above shows the new skyscraper going up in April of 1910. The building was built in two sections with a hollowed-out middle, the north section being completed first.